Every single week without fail I post links to drugstore coupon matchup highlights. I usually don’t give them much of a glance because I’ve never been that much of a drugstore shopper. More and more though, I am realizing that I have been doing myself an injustice. Drugstores are pretty much packed with products that you can take home for FREE (or for very VERY little money)… you just have to know how each store’s saving program works. Walgreens uses Register Rewards (RRs), Rite Aid used Single Check Rebates (SCRs) and CVS uses Extra Care Bucks (ECBs). Back in the glory days Kmart would frequently run their super double campaigns that did NOT require a store loyalty card and did not come with so many stupid rules and stipulations attached to them. 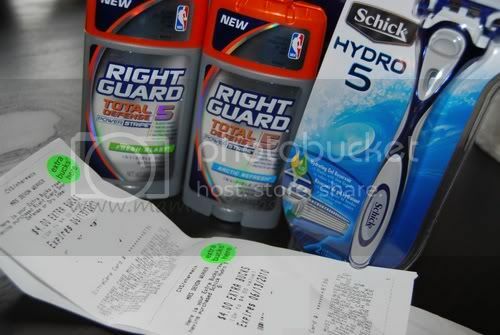 It was always a great opportunity for us to stock up on health/beauty/household items for pennies on the dollar. These days I do the majority of my couponing at the grocery store. While you can still save big and even get free items in the health/beauty/household categories, the drugstores seem to be where the real savings party is happening for those products. Last week I decided to try my hand at some CVS ECB shopping. I want to show you how very simple it is to spend a minimal amount of money out of pocket to score some fantastic deals. To shop at CVS, you only need to have one thing: an Extra Care Card (they’re free and you can sign up for one right in your local store). If you choose to use coupons in addition to your card, you will increase your savings. To save crazy big money at CVS you need to roll your ECBs from week to week. That means you will take your ECBs (they work just like a store credit or gift card) from one week and use them to purchase item(s) that will produce more ECBs. This limits your out of pocket spending and basically let’s you play with CVS’s “money.” Fun, huh? Let me walk you through two super simple deals where I rolled some ECBs. The following week I headed back to CVS. I had my $4.99 ECB to put towards this week’s purchases. And there you go. I used coupons and ECB to purchase new ECB generating items. 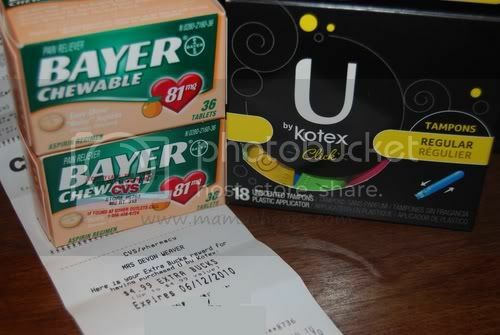 That made it possible for me to walk out of a store with nearly $15 worth of product for less than $1.50 AND I still have $8 ECB to spend at CVS! Even if you only pick up 2 or 3 items each week, it’s worth it. I look forward to continuing to roll my ECB to see my savings really add up. I went today and here is a quick list of what I puchased. After my coupons and a few extra care bucks I paid 40 cents. I have over 15 dollars in ECBs so I don’t mind spending them every now & then and not getting any back…especially when I get something like a gallon of milk! How do you tell how many ECB’s you will get for a specific item? How do you know that item produces a $4 ECB? This sound like a winner… just seen you on doctors… lost my job… I’m on it!!!!! I’ve never been able to find information like what you;re giving out. I can’t wait. My husband and I are both retired. Well, I’m not retired; I’ve been on disability for 21 years. Social Security Disability helps, but it doesn’t pay all the bills. This will help our botom line!!! Thank you. I am thrilled that you found us and can’t wait for you to start watching YOUR savings pile up! It’s crazy – I NEVER thought that I would be cruising the stores for deals or bringing home bags of free toothbrushes and such. It’s amazing. And it’s actually really easy after a little practice. :) p.s. WELCOME!! I saw your info on the doctors today, I’ve been out of work and searching for a year and a half now… this is just what I need to stretch my dollars, do you have any advise on how walgreens works? we live in the middle of nowhere and the closest drugstore is walgreens (it’s still a 40 mile each way trip) thank you! First off, welcome – I’m thrilled that you found the site – and sorry to hear about the fruitless job search. I JUST HEARD ABOUT THIS ON THE DOCTORS SHOW TODAY…I HAD NO IDEA ABOUT THIS….THE SAD PART OF IT ALL IS THAT IM NOT ALONE….WOW,,,,,THNX…I WILL DEF HAVE MY WIFE TRY THIS…. I have been following your posts on FB and love them even though I live in FL some things apply. I decided to try out CVS tonight and ECB’s. I think I am still on a learning curve. I didn’t realize you could still earn ECB’s on item you purchase with your bucks. I spent them all tonight as this was just a fun trial run. for just under 11. out of my pocket, I purchased. Have a feeling I could have done better. …Thanks so much for your helpful info. I have a question about the ECB. 1. How do I know how many ecb’s I get back on an item I buy? 2. How do I use the ecb’s on next weeks purchase? 3. How do I use my ecb points I earned on my green tag? 1) Each week the CVS circular will highlight all of the products that offer ECBs – and it will tell you how many you will get back. 2) Your earned ECBs will print out at the bottom of your store receipt. Hang onto them and then the next time you shop, hand them over just like coupons. 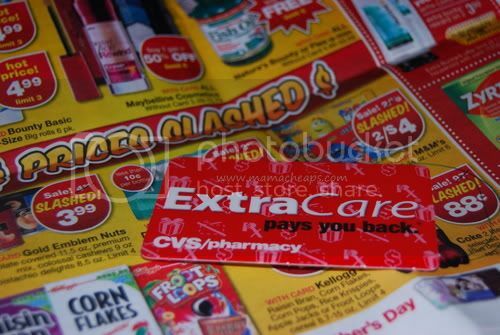 I am very new to this, I have been collecting coupons for at least 2 months now and have only used maybe 5…lol I am going to CVS shortly so let me know if I have this correct…if I purchase 4 things, pay a total of $15.00 get $10.00 back in ECB, I have to use them on my next order so my first order I am still REALLY paying the $15.00? So I am wondering how I am really saving on my first trip. Can someone please let me know if I have this right. Thank you and I look forward to hearing from you soon. Happy Couponing to all!! Regina, you can also plan your strategy ahead of getting to the register (preferably before you even get to the store) and break your purchase into multiple transactions to limit your out-of-pocket expenses. I had $4 in Walgreens RR left over from last week’s shopping, and by ringing up three separate transactions I was able to “roll” additional RR earned on this trip and got $11 in product for less than $2 actually spent. In the end I was left with $1 in RR to use in the future! ive never really shopped at cvs but i would love to save some money whats a good way to start or how? Walgreens does not require a customer loyalty card to get RRs. i never really new or understood how ecbs worked…but you explained it so plainly..i will have to work on this..seems quite tedious though..btw is it the same process with rite aid +UPs?